Knowing the parts of your spine and what can go wrong can help you understand your diagnosis and treatment options. It can also help you protect your spine in the future. Below, you’ll see some popular terminology we use throughout this site. Your spine is made of bones that stack on top of each other. mage_1888482_rightIn between each of those bones is a softer cushion. That cushion is called a disc. The disc has a softer center surrounded by a stronger exterior. A herniated disc refers to a problem with your disc where the softer center pushes out through the stronger exterior and can cause pressure or irritation of the nearby nerves. This irritation can result in pain, numbness, tingling and or weakness in the legs. Sometimes a herniated disc causes no symptoms. If you do have symptoms that affect your quality of life then treatment options are available. Lumbar radiculopathy or sciatica refers to pain that radiates from your back down one or both legs.mage_1888477_right This pain travels down the path of the sciatic nerve or its branches. The sciatic nerve is the largest nerve in the body and supplies function to the legs. The pain associated with sciatica is related to compression or irritation of one or more nerves from your lower back. This is usually the result of another problem, for example a herniated disc. Degenerative disc disease refers to the normal aging process to the disc or spine. Your disc is normally fluid filled in the center and over a period of time this disc will become dehydrated. These changes may or may not cause symptoms. If you have pain related to a degenerative disc it usually causes lower back pain that can range from mild to severe. Even though you may have changes seen by xray or MRI it doesn’t mean you will have pain or that the pain will be permanent. Spondylosis is the normal aging process to the bones in the spine. Another term for spondylosis is osteoarthritis of the spine. It affects the spinal bones and joints rather than the discs of the spine. It also can cause lower back pain that can range from mild to severe. Treatment options depend on the severity of the symptoms associated with the arthritis. Degenerative Disc Disease and spondylosis are both considered to be normal wear and tear changes to the spine. Lumbar or spinal stenosis is a narrowing of the canal where your nerves are held in your lower back. This narrowing is usually a result of disc bulging and spondylosis (osteoarthritis) of the spinal joints. If the nerves are compressed this can cause nerve pain shooting into the legs. This pain can be associated with numbness, tingling, weakness, and rarely bowel and bladder dysfunction. The pain is usually worse with walking and can get better with leaning forward and sitting down. A cervical disc is a round, flat cushion between each of the verterbrae (bones) in the spine. They act as shock absorbers for the spine. A disc that bulges out of place or breaks open is a bulging or herniated disc. Damage or irritation to one or more of the nerves exiting off the spinal cord resulting in symptoms of pain, numbness, tingling, and/or weakness in a shoulder or arm. 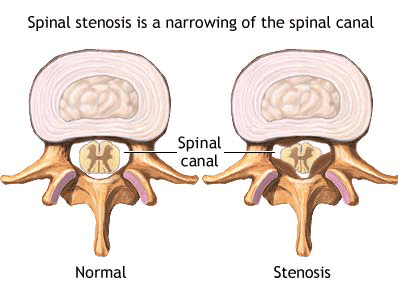 Cervical stenosis is a narrowing of the spinal canal. This is normally a slow, gradual process. This can lead to narrowing or squeezing of the nerves exiting the spinal cord or actually irritate or press on the spinal cord itself. Cervical myelopathy is a compression of the spinal cord resulting from stenosis. Symptoms of myelopathy can include heavy feeling in the legs, gait or balance disturbance, clumsy hands, decrease in fine motor skills, and bladder or bowel dysfunction. Scoliosis refers to a lateral curvature of the spine. Idiopathic scoliosis is of unknown cause and may be related to a family history of scoliosis. Adolescent Idiopathic Scoliosis is the more common form and is found between the ages of 10 and 19. It is more common in girls than boys. It can be progressive and it is important that the curvature be monitored by a physician. Scoliosis (lateral curvature of the spine) found in individuals greater than 19 years of age. Causes include idiopathic scoliosis missed in childhood which progressed and became symptomactic or other conditions including degenerative disc disease, congenital abnormalities, trauma or fractures, and neuro-muscular diseases (post-polio syndrome, muscular dystrophy, etc).